Clemson Girl: What a difference a year makes. Clemson vs. UNC game prediction. What a difference a year makes. 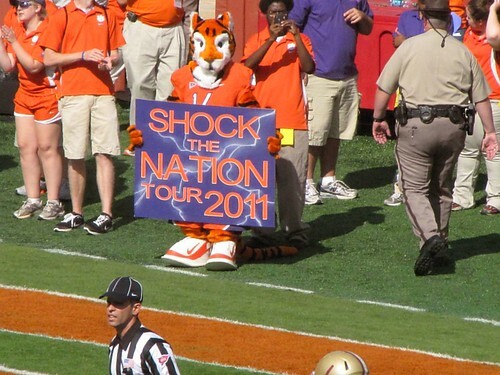 Clemson vs. UNC game prediction. It was a little over a year ago when the Clemson Tigers traveled to baby blue country to take on the North Carolina Tar Heels and came away with a miserable 21-16 loss. After the game, a tearful Dabo Swinney addressed a tent full of reporters explaining that he knew there were problems on his football team and that the feeling of losing that game is something that he never wanted to feel again. He ended his remarks promising the Clemson nation that he would get the ship corrected and make them proud to be Tigers again. Coach Swinney went from tears of sadness and defeat at Kenan Memorial Stadium in Chapel Hill in October 2010 to tears of happiness after his team presented him with the game ball following a monumental win at Lane Stadium against Virginia Tech earlier this month. So far, Coach Swinney has held up his end of the promise as the Tigers continue their campaign toward an undefeated season. Let’s see how the Tigers and Heels match up for their noon kickoff in Death Valley. The North Carolina offense is led by first year starting quarterback Bryn Renner who is one of the most consistent quarterbacks in the ACC. Recently added to the Manning Award watch list, Renner has completed 128-of-170 attempts for 1,593 yards, and 14 touchdowns. The Heel’s offense will come out in a pro-style set looking to quickly establish the ground game with one of the ACC’s top running backs in Giovani Bernard who leads the Heels in rushing averaging just over 109 yards per game and 5.9 yards per carry. When UNC is running the ball, Renner will try to get the ball into the hands of wide receiver Dwight Jones who, according to reports this week, is the self-proclaimed top wide receiver in the conference. With a healthy Andre Ellington, the Tigers finally have their explosive running game back. Ellington rushed for over 200 yards against the Terps a week ago behind an offensive line that continues to improve and impress. The offensive line will have a daunting task of giving Ellington a hole to run through and protecting quarterback Tajh Boyd against a very talented, NFL-caliber Tarheel defensive front led by 6-6, 290-pound defensive end Quinton Coples. Even with a stellar ground game, look for offensive coordinator Chad Morris to give Boyd the opportunity to throw the ball earlier in the game as he got off to an unusual slow start at Maryland. The good news, though, is that Boyd seems to play his best games in the friendly confines of Memorial Stadium. Boyd should have plenty of success throwing the ball against a UNC secondary that ranks 10th in the conference and 92nd in the nation against the pass. Once Clemson put all of the pieces together, the special teams unit became special again. Sammy Watkins finally had his moment to run a kick back - hitting a crease the size of the Grand Canyon and taking it 89-yards untouched to the end zone. Punter Dawson Zimmerman is having another great year as he handles punts, kick-offs, and holds extra points and field goals. And, Chandler Catanzaro, who many were unsure about coming into the season has found his groove hitting 12-of-14 field goals this season. This season the Tigers are 20-7 (3-0 this season) in redemption games, or games where the opponent beat them on the road the previous season. I expect Clemson to move to 4-0 in this category behind another career game for Chad Morris’ offense and an inspired performance by defensive coordinator Kevin Steele’s defense. Even if the Tigers aren’t leading at halftime, as they have been down 3 times this season, don’t expect the players or coaches to panic. 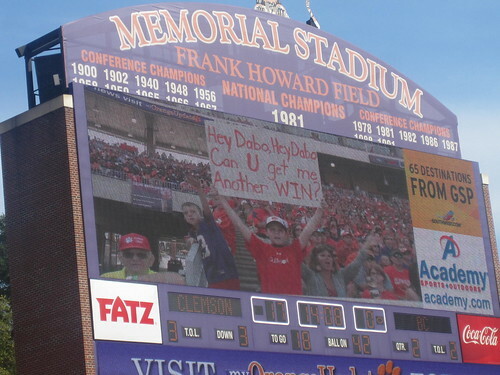 Clemson handles adversity just as well as it handles success. Look for Clemson to extend their streak of scoring in 19 consecutive quarters as it sends John Swofford, Ron Cherry and the rest of the baby blue faithful back to wine and cheese country.